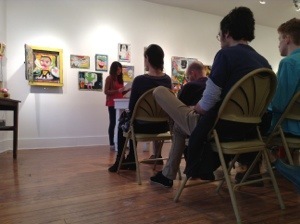 Last Saturday I was wowed by a reading at a neat little art gallery in Cincinnati. Rochelle Hurt read from her new poetry collection, The Rusted City, a brilliant narrative poem sequence with language sharp and gritty that reminds me of Madeline is Sleeping and fairy tales. Anne Valente has a short story collection coming out with Dzanc Books. She read a story about Amelia Earhart and girls who turn into bears–gorgeous and affecting, each sentence powerful. The strength and sorrow in her prose reminds me of Lauren Groff when she writes magical realism. While these two talented writers read, cartoon drawings on the art gallery walls behind them laughed and grimaced and screamed, voicing the audience’s thoughts. The audience was completely bewitched. What a great night for writing!